This is light and fresh. Great for dessert, wonderful for breakfast! Bakeware: I used a Silicone bakeware mold called “Flexipan Charlotte Mold” from Demarle at Home. Each mold holds 3 oz. If you don’t have something this pretty, you may use any variation of a 3-4 oz ramekins, custard cups and large muffin pan. If using non-silicone molds, lightly butter and flour each cup. Working with 1 orange at a time, and using a sharp knife, cut a slice off both ends of the orange, stand upright and peel off pith in strips, following the contour of the fruit. Holding the orange in one hand, cut along either side of each section to release it from the membrane, letting each section drop onto a bowl. Sprinkle 1/2 tablespoon of brown sugar on each mold or ramekin, add 3/4 of a Tablespoon of melted butter on top of brown sugar and mix to coat sugar. Place ramekins or mold on rimmed baking sheet. Using an electric mixer on medium-high speed, beat together the 1/2 cup butter, the granulated sugar, and the orange zest until creamy. Add the eggs, one at a time and beat well. Add flour, baking powder, soda and salt. Fold into batter with rubber spatula. Stir in cream and vanilla until thoroughly incorporated. Spoon batter over the oranges, dividing it evenly among the molds. Bake until the tops are golden, and a toothpick inserted into the center of a cake comes out clean, about 20-25 minutes. Let cool for about 10 minutes before inverting them onto individual plates, or platter. 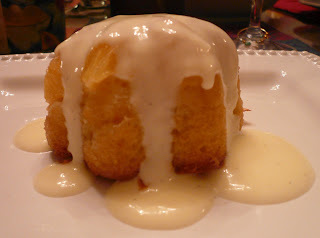 Spoon creme anglaise over the top of each cake and enjoy.